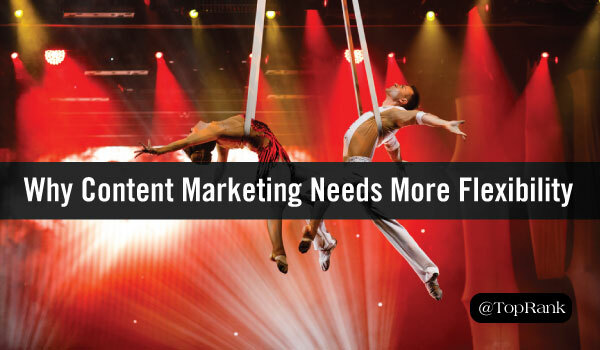 Flexibility in Content Marketing Strategy: Do You Need Another Blog Post? For at least a decade, the 500-word blog post has been the atomic unit of content marketing. Marketers like Joe Pulizzi and Marcus Sheridan built their entire careers on blogging. In Joe’s case, he started the blog without a business plan or a product, and developed both after building an audience through insightful, valuable blog posts. Even TopRank Marketing relied on blogging as a tactic for building thought leadership and establishing authority. When new clients partner with our agency, they’re frequently looking to follow in Joe and Marcus’ footsteps. They’re likely to request 15-30 short blog posts a month as the foundation of their content efforts. But we’re more likely to think in terms of content units—the amount of effort the content team will put in, rather than the specific output. Should you focus your time and resources on a blog? Are there better ways to serve your audience? Here’s how our agency is changing the way we think about content. One of the chief purposes of a blog is to capture search engine rankings. You write useful content, people find it via search, they subscribe and keep coming back for more. But short blog posts aren’t great at capturing rankings anymore. There’s just too much short-form content out there for even the most optimized post to rise above it. Longer-form content tends to dominate search rankings. Comprehensive, in-depth best answer content will not only rank higher for the main search term, it’s more likely to include (and rank for) long-term keywords as well. Just ask Neil Patel, of Kissmetrics fame. He posts 1500+-word blog posts on the regular. You’ll find his posts on any list of highest-ranked or most-shared content on any topic he addresses. Most of us don’t have the time and resources to post best answer content every day, but that’s okay—a steady drip of high-quality content is still preferable to a deluge of shallower takes. The very structure of a blog means that old posts are less likely to be read than the latest post – and the latest one quickly joins the seldom-seen archives. This kind of content is good for satisfying subscribers, but not great for long-term search visibility. The end goal of repurposing content is to take old blog posts and turn them into evergreen assets – so it makes sense to actually design evergreen assets as part of your strategy. Last year, mobile internet use outstripped desktop use for the first time ever. In other words, all new internet traffic is happening on mobile devices. That’s significant for content creators, because 84.9% of smartphone time is spent in apps, versus on the mobile web. While desktop users might have spent more time reading blogs and visiting websites, mobile traffic is concentrated in apps like Facebook, YouTube, and Twitter. These apps require a different type of content to earn audience attention. That’s not to say that blogging is dead, of course. A blog can be a great place to interact with customers and prospects, build credibility, establish thought leadership, and round up subscribers. But focusing exclusively on creating a ton of blog content is no longer the best strategy. Instead of creating a set number of blog posts a month, focus on the outcomes you want to achieve. The deliverable should match your goals, not the other way around. You’ll end up with a more efficient use of your time and resources, and content assets that get the job done. Trading short-form blog posts for video content is another useful tactic. Video can be embedded in a blog post, but also find another life on Facebook and YouTube. Our client DivvyHQ recently published a video series with the videos hosted on YouTube. They can serve their blog audience, but also reach out to a new audience through the YouTube app. TopRank Marketing creates a weekly news video that we post to Facebook, and each video earns hundreds of views natively on the platform. If your daily blog responsibilities have kept you from exploring influencer marketing, it’s high time to devote attention to it. Influencers can help boost your credibility, increase visibility, and create relationships that will serve your business in the long-term. A single influencer co-created asset can achieve far higher visibility than the most comprehensive blog post. The humble blog post had a good run – it dominated content marketing strategy for the 00s and most of the 2010s. But the content landscape is changing, and we need to change with it. Don’t ditch your blog just yet, but do examine how you’re using the time and resources available to you. Focus on your desired outcomes rather than a rigid set of deliverables. Give your content team the flexibility to explore new strategies, and you can evolve your content mix along with your audience’s demands. Blogs are worth an awful lot more than most marketers let on, and work as a team with your website and social media marketing efforts to ensure deeper penitration in online search for your online assets ( ALL OF THEM ) The thing you need to address is SEMANTIC TRUST and your #SEMANTICFOOTPRINTS Blogging gives you the tools to place semantic Linkages between your digital assets in meaningful ways that both search engines and your intended target market audience can understand and relate to. Understanding how your blog interacts with your website, and managing these linkages through well thought through socoal media activities which add value to both your website and blog posts y enhan ing the expanded conversation of the comment streams of both your blog posts and your social media posts. Your blog thus serves many different purposes, and you do need to document these as you go along. This list of purposes that your blog serves should grow over time, and be revised at least once a month, just to remind you of the true power that comes along with a well managed blog, which services your intended target markets primary I formation needs in your niche market space. Your blog must thus be very niche specific and not drift too far off topics. Thanks for your comments! I agree that a blog can be a powerful marketing tool, but still think it’s not enough to simply write a bunch of short-form content, regardless of how relevant or knowledgeable it may be. I would rather put more effort into “pillar pieces” with supporting blogs, influencer co-created content that is integrated into a strategy that includes organic and paid amplification. What an insightful article you have here. Informative and useful indeed. The fact is that, as a content marketer you need to consistently create valuable content that will attract and retain your audience. I agree with you that quality beats quantity. In fact, in my recent article is which has been scheduled to go live next week, I discussed a similar topic about the quality of our content. We are in a digital edge where there’s constant change in trends, including the way we produce content. And as you pointed out, the era of a 500 word blog post have gone. We are in a era of a long-form content. I recently decline a project where a client asked me to create a 500 word blog post. Why? Because as he outline his requirements it wouldn’t be a valuable article. And with the rise of voice search which has a great impact on SEO, long-form post has become the norm. Furthermore, influencer marketing has taken centre stage I’m the digital marketing space, making if a worthwhile venture to invest in influencer making. Th benefits are enormous. Thanks so much for this epic article. Thanks very much! Definitely agree that influencer involvement is one of the most powerful tools marketers have at our disposal. When done properly, it provides value for the client, the influencers, and the audience. We’re committed to raising the level of sophistication in influencer marketing, making it strategic and sustainable. You have shared great informative article. I must say you are a perfect content writer. Every content writer should follow these tips as you have shared above. Thanks and keep sharing such tips & tricks with us.. Thanks for sharing your option Joshua!